Today: A last-minute hors d'oevre to keep your guests happy -- and make you look good. We know how it goes around this time of year: a family member (or two, or three) calls, and says they're twenty minutes away. But there's no need to panic -- as long as you have some puff pastry lying around in the freezer (store-bought or homemade), you'll be able to place an hors d'oeuvre on the table with minutes to spare! 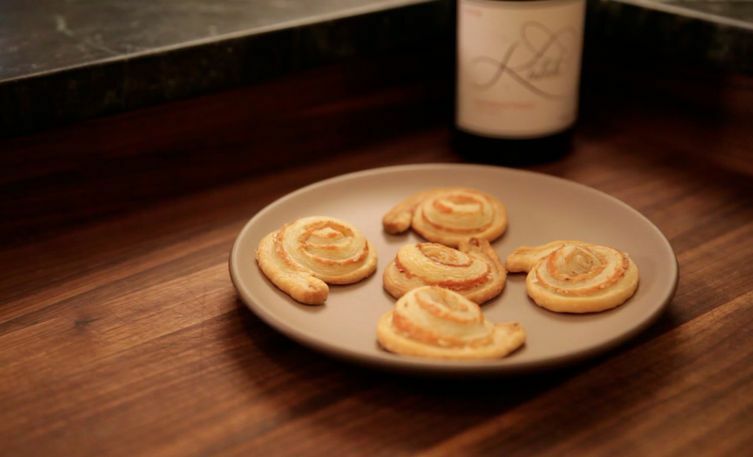 Watch Merrill whip up puff pastry pinwheels filled with parmesan and mustard in a flash, then come up with your own combinations, sweet or savory, and share them with us in the comments. I have a friend who does these with Marmite . They are delicious, as yours look too. You could make it Indian style by grating some "paneer" (indian cottage cheese) and mixing it with a bit of curry powder and cilantro. Looks pretty as well! It's also okay if you planned to do this all along! ;-) Puff pastry is an item that should never be missing from your freezer. I put the leftover egg wash from pie crust (etc.) in there with a mix of cheeses (usually parm and gruyere/swiss from onion soup) and whatever herbs I have on hand. The egg helps keep the cheese in place. I mix it up, but this year's holiday snacks table featured pinwheels with gruyere and a sprinkling of chopped mixed green and black olives. They were gobbled up. I like prosciutto and pesto, also sundried tomato pesto and chèvre. Olive or sun dried tomato tempenade. i go for proscuitto or something similar and grated cheese - emmenthal or comte etc. You can make in advance and freeze, well wrapped. Then heat the oven to 400 or so and pop them in.